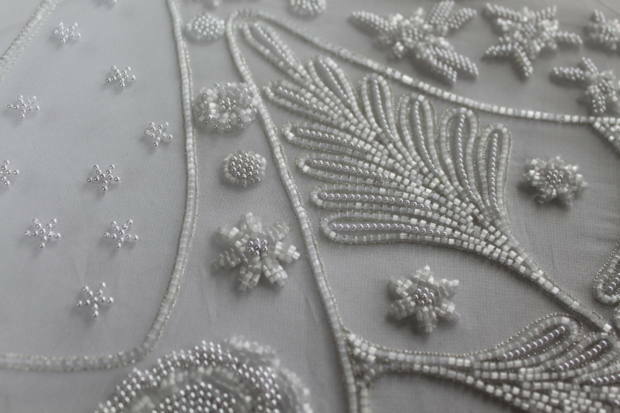 One question we get asked a lot at H&H is the differences between Tambour and Ari beading, technical differences, the pros and cons of each and which is faster. Both tambour and Ari work off of the same principals of applying beads to fabric using a specialised hook. Using the hook a chain stitch is created through a twisting motion of the tool allowing the beads to be applied in a continuous line. Tambour is the name given to this kind of work in the west, and is believed to have come for the french word ‘Tambour’ as in drum because of the fabric is stretched in the frame. Ari is the name used in the East, countries such as India and Pakistan have a rich history of using this technique for sari making. In Tambour, the beads are loaded up onto the thread first and then the piece is worked on from the wrong side (back) so any guides are only applied to the reverse. This means that you can work on a continuous thread until you finish the area, which makes it very quick, avoiding any unnecessary starting and stopping. One challenge with Tambour however is that you can not really see the work while you are working on it unless the material is particularly transparent which some people find more difficult. 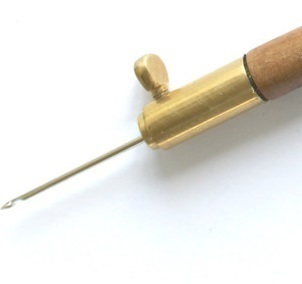 In Ari the beads are loaded onto the hook itself so you would load up as many as is comfortable onto the hook, work with them, release the thread, reload the hook and begin again. This allows you to work on the right side of the fabric and see the beads as they are applied but does require you to stop and start as the beads are used up. 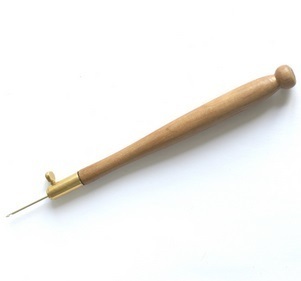 There is also some differences in the tools used for these two stitches, the Tambour hook is placed into a holder, usually wooden which allows the size of the hook to be changed according to the work in hand. Notice that the hook is quite long in itself and almost closed to help it to pass freely through the fabric without snagging. The Ari hook is set into a metal or wooden holder so can not be changed between jobs although they too also come in different sizes. The hook part itself is wide but tiny to allow the beads to slip off when applied and to pass through the fabric easily. 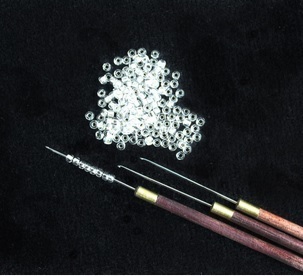 Both techniques are not just restricted to beads, they can also be used to create the chain stitch allow as a decoration in its own right or to apply sequins instead of beads. As to the question of which is better, that is down to the creator to decide as to which they are more comfortable with, the effect in the end is almost identical. 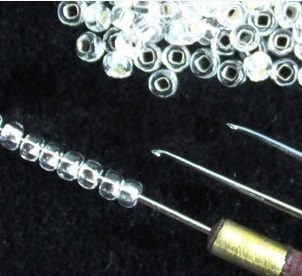 If you would like to learn more about these couture beading techniques, have a look at the London Embroidery School website for classes and courses on Tambour Beading as well as a way to purchase the Tambour and Ari hooks shown above.